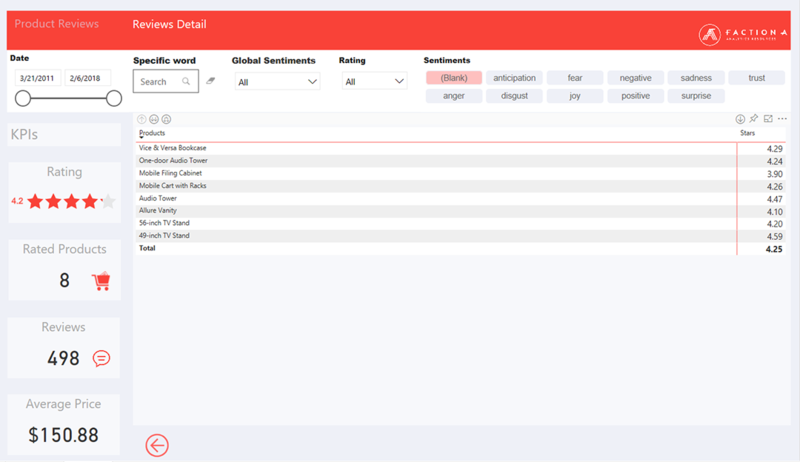 The Faction A squad created this Interactive Sentiment Analysis Dashboard to demonstrate the various analytic possibilities from all the data available from online retailers. Online retailers generate a lot of data directly on the Web every day. These data, often unstructured, contain very valuable information for companies, provided they can be easily accessed and analyzed. 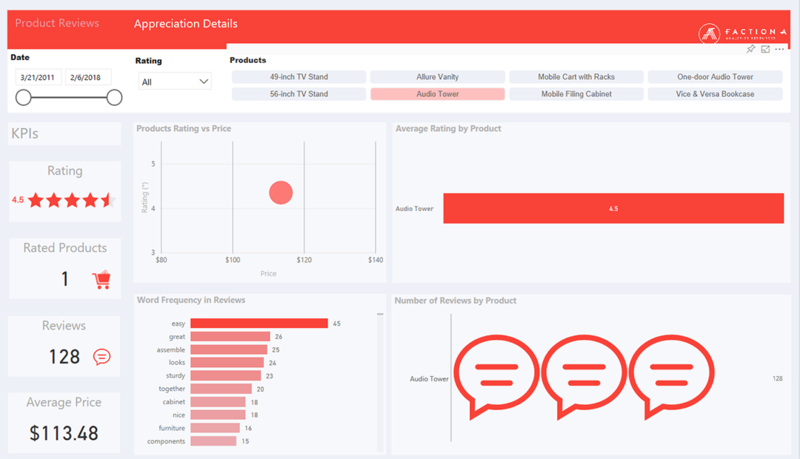 This dashboard created by the Faction A squad provides an example of text analysis leading to a sophisticated analysis of customer sentiments. 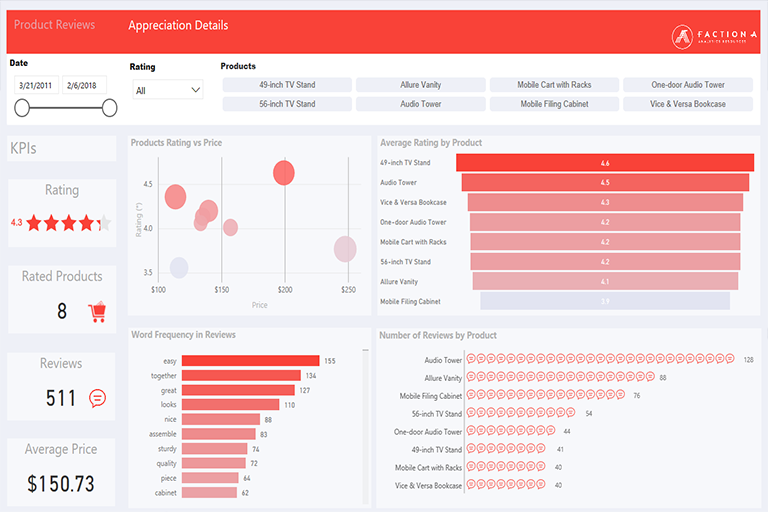 This dashboard enables the discovery of product appreciation by customers as well as several other information such as criteria of satisfaction and dissatisfaction for the same products. All the required information is obtained from the websites of major online retailers. 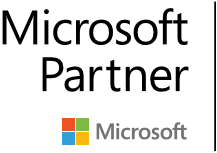 • The indicators to the left provide an overview of the company's products. • Different filters available at the top. • You can directly compare two or more products by pressing the CTRL key to make multiple selections. • The mouse over function displays more information. • Each graph can be enlarged by clicking on the upper right corner. The first chart compares the Product Rating versus Price on a scale of 5. This answers the question: are the more expensive products more severely evaluated, especially because of higher expectations? The second graph shows the Average Rating for each product. We quickly see that the product "49-inch TV Stand" is much more popular than the product "Mobile filing cabinet". The chart at the bottom left shows the Word Frequency in Comments. These keywords provide very valuable clues to customer satisfaction or dissatisfaction with the products. For example, we find that "easy", "together", "assemble" and "piece" are repeated often, that may indicate the products are generally easy to assemble. The last chart shows the number of Reviews by Product. It is easier to interpret and extrapolate the results for products with many evaluations. The use of filters can help isolate problems for example by filtering on the ratings of one and two stars. We quickly see that negative words like "cheap", "damaged" and "screws" stand out. This can point to a problem with packaging or missing parts. To achieve the Sentiment Analysis, the data retrieved from the Internet must be cross-referenced with different data dictionaries that classify each word either by feeling or by assigning scores from -5 (for the negative) to +5 (for the positive). 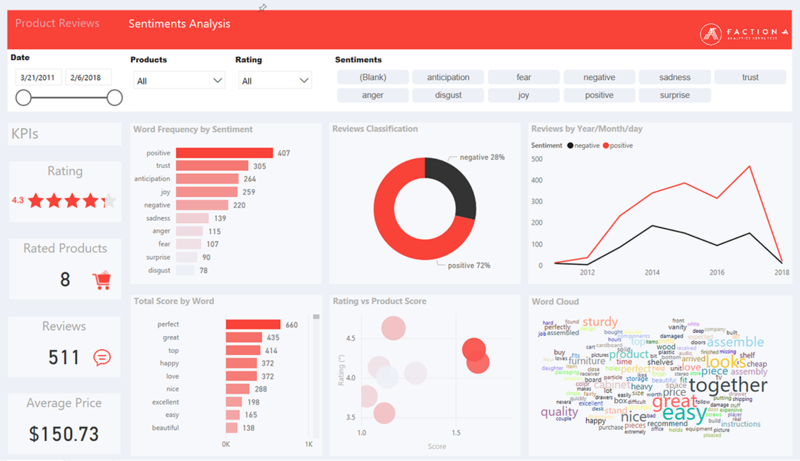 The second tab provides information such as: Word Frequency by Sentiment, Reviews Classification, Reviews by Year/Month/Day, Total Score by Word, Rating vs Product Score, and a Word Cloud. The Word Frequency by Sentiment graph shows what feelings dominate in the reviews. Positive feelings like "positive", "trust" and "joy" are among the first. The Reviews Classification donut chart second graph ranks comments more generally, either positive or negative. 72% of comments are positive, which correlates well with the overall rating of 4.3 stars. This last tab offers the opportunity to drill down to the exact content of every single review for each product. This helps understand the context of the comments. There is also a search tool at the top that finds the use of specific word in all the reviews.